All animals exhibit some telltale signs that the end of their life is approaching and dying cats are no exception. Learn how to recognize these signs so you can help make your cat's life more comfortable as he nears the end. It is an unfortunate fact of life that death must also occur. It is difficult to watch a dear friend reach the end of his days as many cat owners will attest. It's possible some cats will die unexpectedly or blessedly in their sleep. What cats do when they are dying can vary, but according to Feline CRF.org, many cats will exhibit certain behaviors and signs before they pass on. Some common signs of a cat dying are obvious changes in their normal temperament, a noticeable increase in hiding behavior, a loss of appetite for both food and water, and changes in their overall appearance. Appearance changes can include dull, matted fur, urine or feces in their hair, dilated or glazed eyes, lack of blinking and a "sunken" look. Cats dying will often have seizures as well and will have difficulty breathing. A cat that is sick and dying will often go through a drastic personality change. If he was formerly an outgoing fellow, he may now become something of a recluse and become irritable if you try to handle him. This is likely because he's in pain and doesn't want to be touched. On the other hand, some cats that were quite independent when they were healthy may now seek out the companionship of the owners as death draws near. This can be a difficult symptom to interpret as many non-life-threatening illnesses can also lead to this behavior. Cats seem to have the ability to know that they are going to die. A sick cat will often begin seeking out places that are comfortable to him, yet away from his owners. For pet owners who allow a cat outside, this can cause problems. Cats will often seek out cool, shaded areas, such as under bushes, thickets of wild grasses or under vehicles. If your sick or aging pet has suddenly pulled a disappearing act, check in these areas around your home first. Indoor pets will exhibit a similar behavior, seeking out cool, dark areas in which to rest. Typical hiding places in the home include the cellar, under beds or in rooms used for storage. A dying cat may not even come out when it is time for meals, to drink water or use the litter box. Cats that are ill or dying will avoid eating food and drinking water as well. A cat that isn't eating at all, even when you tempt him with a favorite treat, is either very ill or close to dying. While a cat may skip a meal or two occasionally, an animal that hasn't eaten two or three meals in a row should be taken to a vet for an examination. A lack of appetite doesn't necessarily mean your cat is dying, but it should be taken more seriously when seen together with other symptoms. Cats that are dying may also sit near a water bowl, or even hang their heads over the bowl without drinking. A cat that is close to dying may gradually develop more of an unkempt appearance. He won't have the energy to groom himself as he normally would. In addition, his fur may even come out in small clumps or shed copiously. If a cat is extremely weak, he may urinate on himself and can develop an odor or matted fur from this. In addition to a sickly appearance, a cat's eyes may appear dilated when he is close to death. In other cases, a cat may appear to be blind or his eyes are glazed over. If he's severely dehydrated, his eyes may also have a sunken-in appearance. If a cat doesn't blink when touched near the corner of his eye, he is probably unconscious and very close to death. One sign that is exhibited by some cats that are dying is a series of seizures. This is one of the reasons why pet owners should provide their cats with a safe and comfortable place when they are nearing death. A cat that is having seizures may yowl and throw his head backward, making an uncomfortable-looking arch in his back. 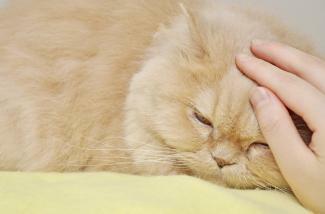 A cat may have one or two of these seizures or much more over a period of several hours before death takes him. During severe seizures, the cat will be minimally responsive between convulsions and will not even try to get up. He may not know you or his surroundings. A cat's breathing may change when he is dying. Some animals will pant during their last hours or make wheezing sounds. The cat may keep his mouth open with his tongue hanging out. Toward the end, some cats will make little gurgling noises as the respiratory system begins to shut down. If a cat is panting and throwing himself around or rolling, he is in severe distress and probably about to die. In other diseases, a cat may have agonal breaths, which are spasms in which his heart may already have stopped, but the breathing muscles still twitch as the muscles fail. A systemic disease such as kidney failure, pancreatitis, heart disease, or cancer in which your cat is not responding to treatment, particularly if his quality of life is not good. VCA Hospitals provides additional information on how to assess your cat's quality of life. If the vet agrees with you that your pet should be euthanized, you'll be given a chance to say goodbye before the vet administers the shot. Cats often pass away without anyone noticing that they've gone. For pet owners who know that death is imminent, preparing for the event can help them say goodbye to their friend. Occasionally, taking a pet to the vet isn't an option. In these cases, making the animal safe and comfortable is the best thing that you can do for him. If you have access to a large animal cage, place the cat in it along with water, a soft bed to lie on and a litter box. If no cage is available, a quiet room with a door will suffice along with soft bedding, water and a litter box. 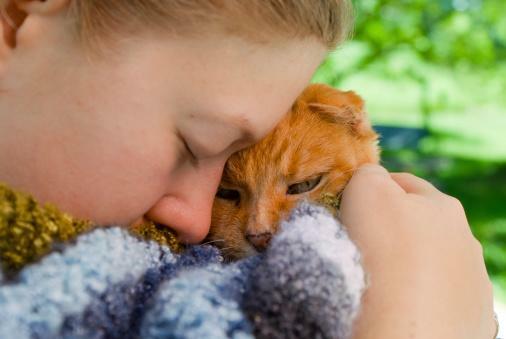 It is never easy to say goodbye to a cherished pet and member of the family, but being able to recognize that your cat is dying might just be a blessing in disguise. You'll be able to give your pet some measure of comfort in his final hours by telling him how much you love him, gently stroking him to comfort him, and just being there with him as he makes that journey over the rainbow bridge.